Epic. That’s my word for race day. Cathie is an amazing coach. She is my running rock! “YES!” I say. I knew it would be though. I could feel it. 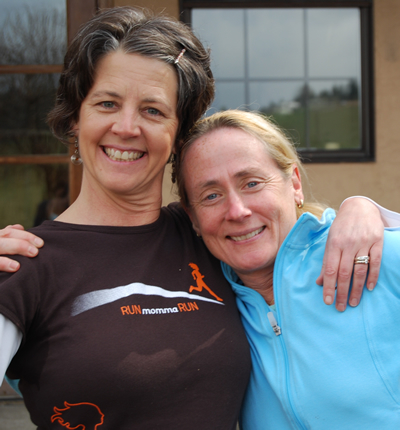 Like my last race, the Ridgeline Ramble 20K, I knew it would be an “on” day. A day that I felt strong. A day that I came to the starting line with nothing naggling, nothing injured, no questions, no uncertainty, no doubts. I credit my coach for that feeling. This race was for Cathie. Getting to the starting line healthy, strong and well-trained is all her fault. I don’t lack motivation. I’m weird that way. I await her training spreadsheets each week like I’m waiting for Santa. When she pushes me, I’m stoked! When she makes me take it easy, well, I’m a bit less stoked, but I know she’s always right. That “epic” feeling also includes being surrounded by glorious pre-race gifts from my runner besties! The latest in early-morning-run-fasion – the AmyPottery Coffee Mug. Fits in coffee cup spot in your car, easy to carry, keeps it hot and it’s a piece of art. Thank you T-buns! My beloved Michelle set me up with my favorite FOOD – Rice Crispy Treats – Trader Joe RMR style! 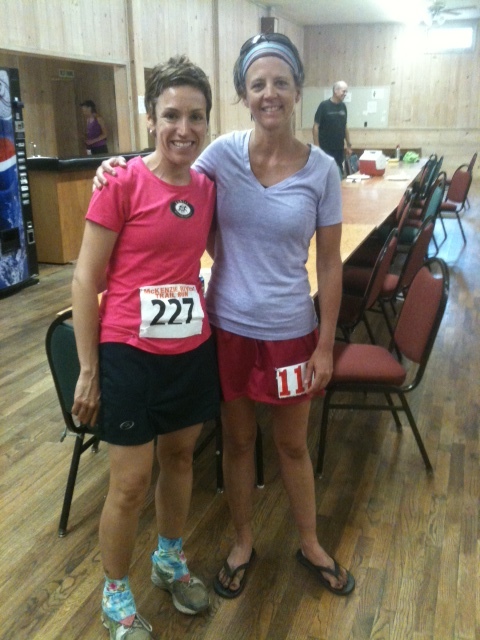 Cathie & I celebrated with more of same post-race. With great support from my buddies, how could I NOT have a great day? Plus, I was about to hook up with an amazing person and swap food, share life stories, pee in the woods together and encourage each other over lava, roots and rocks for 31 miles. That’s her in yellow, below. (From left to right) Ilisa, my “security blanket” as we called each other during the race, Shelley, a random guy, Todd and Julia – hanging out before the race. I love how Julia is holding the Glide (or is it deodorant?) like it’s a can of beer. Glide applied, snacks packed, shirts piled on the drop bag tarps and last minute pees taken BEHIND the porta potty (because the line was too long in FRONT of the porta potty), and we were headed to the start. But wait, I forgot to tell you the Garmin story. Ah, tin foil. Kinda like gray tape for technology. 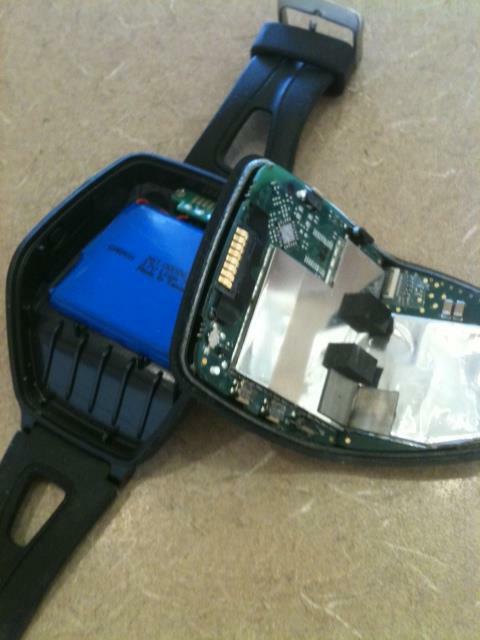 Once upon a time, I had a Garmin 205. It lasted a blissful 4 years before its face fell off one day mid-run. So, for my long training run along the McKenzie river trail several weeks beforehand, I borrowed one. I clicked start, or so I thought, but the timer never started. I didn’t fuel on time and kind went coo coo. So coo coo that I accidentally left the borrowed watch at the water’s edge of Carmen Reservoir when I took a post-run ice bath. Ugh! I drove up the next day to look for it. Gone. I didn’t have enough time to buy a new one for various reasons, so I borrowed another watch from the same gal I borrowed the first one from . This time, on race day, it never turned on at all! Fortunately, the best thing about starting lines is….you just gotta start running! There’s no turning back. All the excruciating details of training fall away into the simplicity of one foot in front of the other. There is nothing you can do about anything. Hmmm, maybe I did need a lesson. The gun went off. I ran. I smelled the forest. I tried to “feel” it. I made it to race day. I made it back to running long distances from being injured for so long last year. Making it to the start felt like I had won. I was instantly transported to heaven and stayed there for 31 freaking awesome miles. We started out slowly. Ilisa and I fell in toward the rearish of mid-pack. The single track line of runners seemed long and too slow as we climbed up toward Sahalie falls. But, I kept telling myself this was a good thing. No sense in screwing up a perfectly good race day with starting out too fast. Been there, run that. After the climb, which was really the only climb on the course, it was all fun as we approached the first aid station at 5.7 miles, Santiam Wagon Road. High fives, a slice of watermelon, an imaginary “check” in the air, a jog around the orange cone and we were headed to our next restaurant in the dirt, Carmen Reservoir at mile 11.2. It was delicious, of course. The volunteer support at this race is fantastic as was the spread; chips, cookies, quesadillas, boiled potatoes with salt, Bugles and loads of watermelon and cantaloupe – my favorites – were plentiful! I learned from my first 50K, Siskiyou Outback, that fruit is a perfect blend of easy-to-digest water and sugar to supplement my Gu. Potatoes are also a hit. Gotta love a mid-race salt lick! Kick your heals up, lift your knees up, heck, just stay up! Treats in tow, the next 6 miles were challenging, technical and can be summed up in two words: Lava Rocks. How do you handle a trail full of sharp objects? A trail section where mountain bikers CARRY their bikes? Use the RiverDance technique. Still, it’s hard not to fall. Ilisa took a few epic tumbles. After the first one, which sent her careening into a giant log, she got up, looked herself over and said, “Well, nothing’s impaled. Let’s go.” She had me at impaled! I love this woman! After that section, it was all downhill from there. The last section was woodsy, windy, pretty and with my security-blanket-perfect-pacer, Ilisa in front of me, I felt the best kind of tired and soreness creep in on the next 5 miles. You know the kind that says, “Hey, you’re working pretty hard, but nothing is going to kill you and because you’re on a caffeine/sugar/distance/race high right now, you’re quite the rockstar!” Love that voice. Leah and I – hot mess mommas! Yes, SERIOUSLY! Ilisa and I finally spy the shoot up a short, steep embankment and give it all we got. We crossed the finish joined at the hip. Sweaty hugs, laughter, glassy eyes looking for familiar faces, stumbles toward the porta-poty, lots of OMGs follow. Ilisa headed home with her son. I stood for a while cheering finishers and was so excited to spy Leah coming through looking strong! We decided lunch was in order and, after retrieving her van from the starting line up the road, had our fill of burrito-rice-chip yumminess and counted our remaining toenails. I drove home alone, filled with the euphoric feelings of a day spent thrashing my body doing something I absolutely love. At home, my awesome husband was grilling up a steak for dinner (an upgrade from my usual post-race hamburger splurge) and chillin’ the beer. 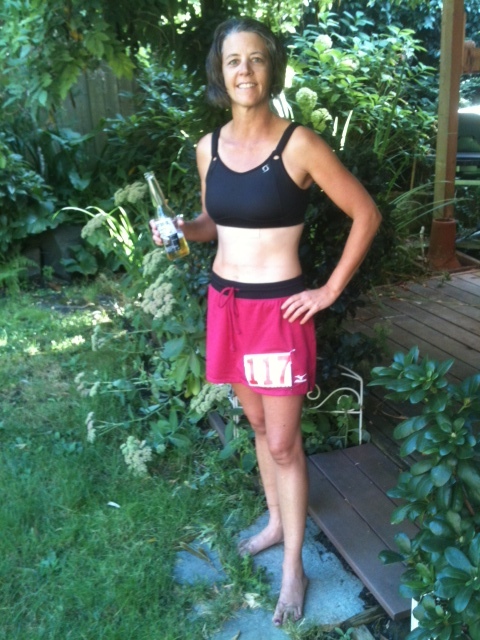 After my mega-chaffing experience on my last big training run, I decided to run in a bra and my fantastic Mizuno skirt. Less to wear, less to rub. Worked like a charm. It was such an epic day, it took me a while to get in the shower. I just didn’t want to wash off anything that represented my accomplishment, my journey. Plus there was the cold beer and that comes first. Good as a 1st 50K? People have asked me if this would be a good first 50K. Some folks have told me it was perfect for a first, some not. Having only done one other before that was classified as mountain running, starting at 6,500 feet elevation with thousands of feet in elevation change, the McKenzie River Trail required less hill training and seemed easier in that respect. However, it’s extremely technical. You really can’t take your eyes off the trail for even a second unless you’ve got endo-thrill-issues. If you’re lucky enough to live close to the trail and lucky enough to get into the lottery, I recommend doing some training runs there where you can take your time and see the gorgeous waterfalls and soak up what feels like a magical fairy forest. They did it up right. Being a big fan of race medals (probably because I sell those snazzy marathon medal display racks), I was admittedly a little bummed that we wouldn’t be getting one. BUT, what we did get was saweet and totally useful. Bottle of red wine with cool MRTR 50K design, sweet fleece hat that I wear all the time and a groovy travel blanket. Awesome for the family – waterproof on one side, snuggly on the other. Thanks for letting me share my loooong race report with you. Congratulations to you if you made it this far. It truly was the Best. Race. Day. Ever. Great race report! I’m doing my first 50k in Feb, I hope it’s as EPIC as yours!! Congratulations! !